The Free State of Thuringia ( ; German: Freistaat Thüringen, [ˈfʁaɪʃtaːt ˈtyːʁɪŋən]) is a federal state in central Germany. It has an area of 16,171 square kilometres (6,244 sq mi) and 2.29 million inhabitants, making it the sixth smallest by area and the fifth smallest by population of Germany's sixteen states. Most of Thuringia is within the watershed of the Saale, a left tributary of the Elbe. The capital is Erfurt. 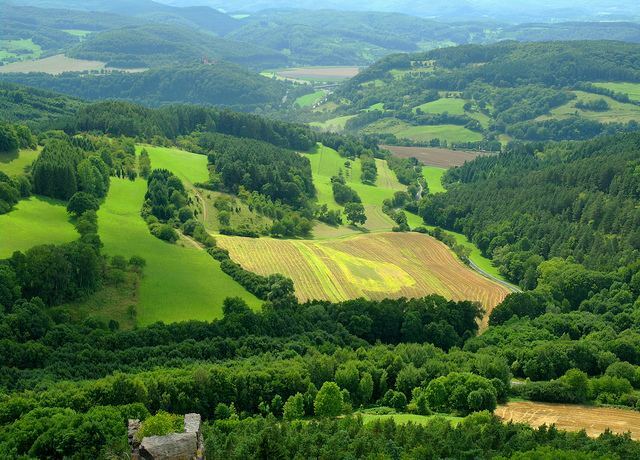 Thuringia has been known as "the green heart of Germany" (das grüne Herz Deutschlands) from the late 19th century, due to the dense forest covering the land. It is home to the Rennsteig, Germany's most well-known hiking trail, and the winter resort of Oberhof making it a well known winter sports destination. Half of Germany's 136 Winter Olympic gold medals (through the Sochi games in 2014) have been won by Thuringian athletes. Johann Sebastian Bach spent the first part of his life (1685–1717) and important further stages of his career in Thuringia. Goethe and Schiller lived in Weimar and both worked at the University of Jena, which today hosts Thuringia's most important science centre. Other Universities in this federal state are the Ilmenau University of Technology, the University of Erfurt, and the Bauhaus University of Weimar. The Thuringian Realm existed until after 531, the Landgraviate of Thuringia was the largest state in the region, persisting between 1131 and 1247. Afterwards the state known as Thuringia ceased to exist; nevertheless the term commonly described the region between the Harz mountains in the north, the Weiße Elster river in the east, the Franconian Forest in the south and the Werra river in the west. After the Treaty of Leipzig, Thuringia had its own dynasty again, the Ernestine Wettins. Their various lands formed the Free State of Thuringia, founded in 1920, together with some other small principalities. The Prussian territories around Erfurt, Mühlhausen and Nordhausen joined Thuringia in 1945. In July 2013, there were 41,000 non-Germans by citizenship living in Thuringia (1.9% of the population − among the smallest proportions of any state in Germany). Nevertheless, the number rose from 33,000 in July 2011, an increase of 24% in only two years. About 4% of the population are migrants (including persons that already received the German citizenship). The biggest groups of foreigners by citizenship are (as of 2012): Russians (3,100), Poles (3,000), Vietnamese (2,800), Turks (2,100) and Ukrainians (2,000). The amount of foreigners varies between regions: the college towns Erfurt, Jena, Weimar and Ilmenau have the highest rates, whereas there are almost no migrants living in the most rural smaller municipalities. The birth rate was about 1.8 children per women in the 1970s and 1980s, shrinking to 0.8 in 1994 during the economic crisis after the reunification and rose again to more than 1.4 children in 2010, which is a higher level than in West Germany. Nevertheless, there are only 17,000 births compared to 27,000 deaths per year, so that the annual natural change of the Thuringian population is about −0.45%. In 2015 were was 17.934 births, the highest number since 1990. Since the Protestant Reformation, the most prominent Christian denomination in Thuringia has been Lutheranism. During the GDR period, church membership was discouraged and has continued shrinking since the reunification in 1990. Today over two thirds of the population is non-religious. The Protestant Evangelical Church in Germany has had the largest number of members in the state, adhered to by 22.2% of the population in 2015. Members of the Catholic Church formed 7.8% of the population, while 70.1% of Thuringians were non-religious or adhere to other faiths. The highest Protestant concentrations are in the small villages of southern and western Thuringia, whereas the bigger cities are even more non-religious (up to 88% in Gera). Catholic regions are the Eichsfeld in the northwest and parts of the Rhön Mountains around Geisa in the southwest. Protestant church membership is shrinking rapidly, whereas the Catholic Church is somewhat more stable because of Catholic migration from Poland, Southern Europe and West Germany. Other religions play no significant role in Thuringia. There are only a few thousand Muslims (largely migrants) and about 750 Jews (mostly migrants from Russia) living in Thuringia. Furthermore, there are some Orthodox communities of Eastern European migrants and some traditional Protestant Free churches in Thuringia without any societal influence.